* LAD is is invariant to non-decreasing transformations. * Notice that while the medians are mirrors of each other (and equal) despite g' < 0. However the quantile have now reversed order thus quantile(.25)=-quantile(.75). * This is because of the mirror nature of the generated data. * But what is more interesting to us how well LAD does at estimating the conditional median. * And qreg is pretty good at identifying the conditional coefficient as 10. * Also, because E(u|x)=med(u|x)=0, OLS also identifies the median. * But what does this mean? 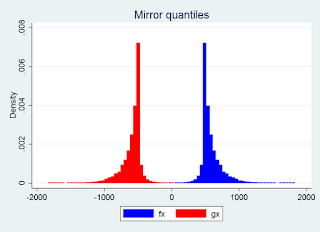 * How well is the quantile regression working? * This regression does not work very well even though it has a higher r2.